We're so excited! It’s our JANUARY RELEASE Day at KRAFTIN' KIMMIE STAMPS!! And we’re celebrating with a KRAFTY HOP!! So grab yourself a cuppa joe, sit back and be prepared for some krafty eye kandy! We're going to inspire your creations with our fun, new stamps! Over the last few days in our Krafty Peeks, we have shared lots of AMAZING new stamps from all our artists for our January release! We’ve got something for everyone!! We’ve got TWO sweet new FAIRYTALE sets featuring our favourite kiddos from Cheryl……ONCE UPON A TIME 3 and 4! There's an awesome new GIRL ADVENTURE set from artist Rachelle Anne Miller called DREAM BIG! Lastly, we are SO excited to share a SASSY new Moonlight Whispers stamp set....LET THE GOOD TIMES ROLL! 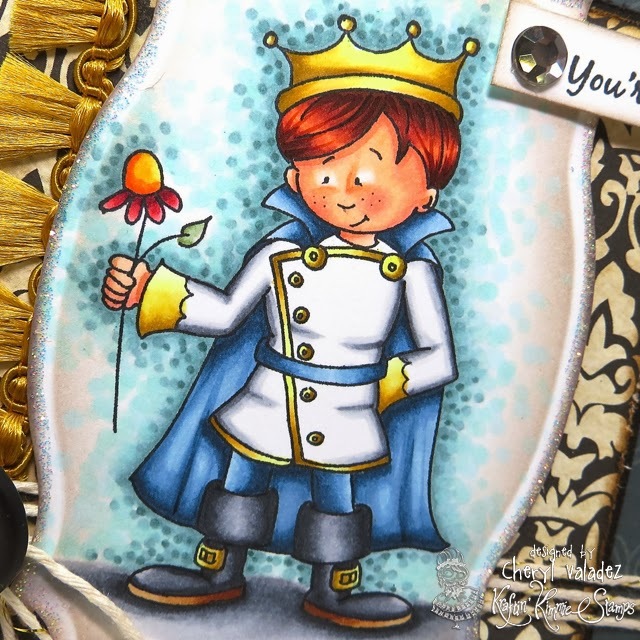 I've used Prince Charming on my card today and he is a real cutie patootie! You can find him in the shop! You will get to see ALL of the new images today as you sit back and enjoy our JANUARY Krafty Hop! As you hop from blog to blog, be sure to leave a comment at each and every stop because some lucky stampers will win packages of these incredible stamps from the new release!! And when you’re done hoppin’, be sure to head over to the Kraftin’Kimmie shop, because ALL the new images are available NOW! Nice detail around the image. I forget what you call that, but adds so much. That is an amazing card! Handsome prince with gorgeous coloring!!! That spotted border, with his freckles, is genius! Gorgeous coloring of this adorable stamp...love the ribbon and backing papers too! Gorgeous card! I love your coloring and papers and the gold trim is so perfect with this prince! He really is a charming prince, and so handsome!! LOVE your coloring and the fun gold trim! wow this is Super Fabulous!!! love it all! your coloring is amazing, fabulous card. A very regal card! LOVE it!! Your coloring is just fabulous. wow...your coloring is stunning and that trim is amazing on your card! Love your prince charming! 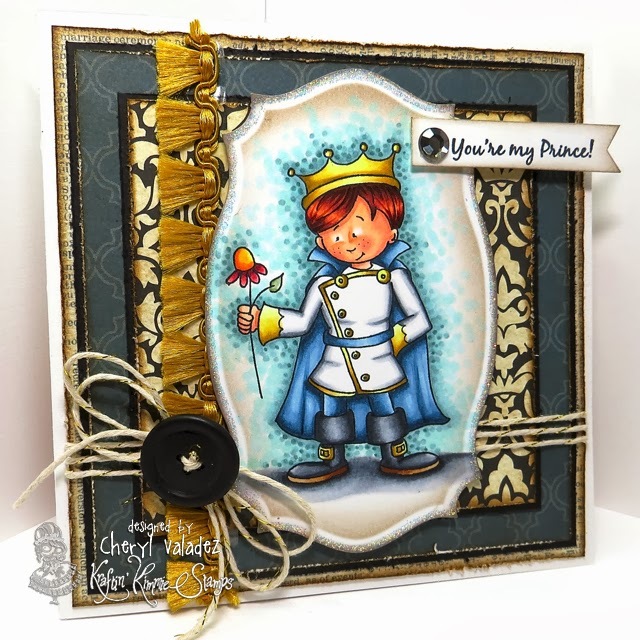 Great masculine card and cute regal ribbon! Awesome card!! Love the gold trim with the image, it gives it the royal feel! !